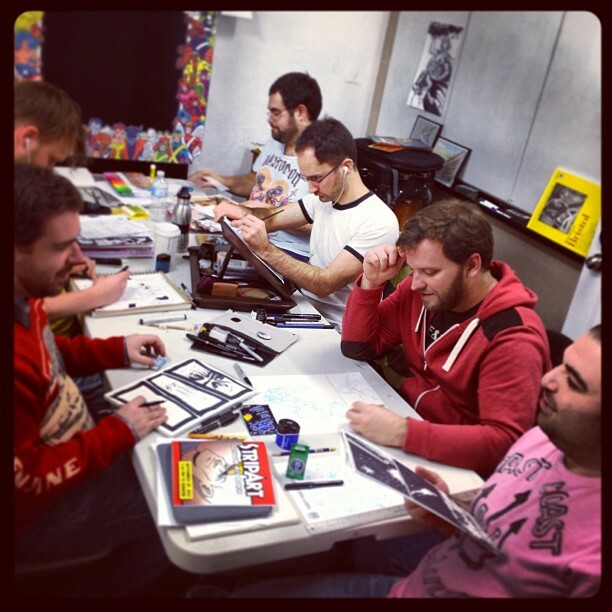 The 24 HOUR COMIC CHALLENGE MARATHON… | Ty Templeton's COMIC BOOK BOOTCAMP!! …ENDURANCE CONTEST OF WILLS is now over and we’re in recovery mode over here! 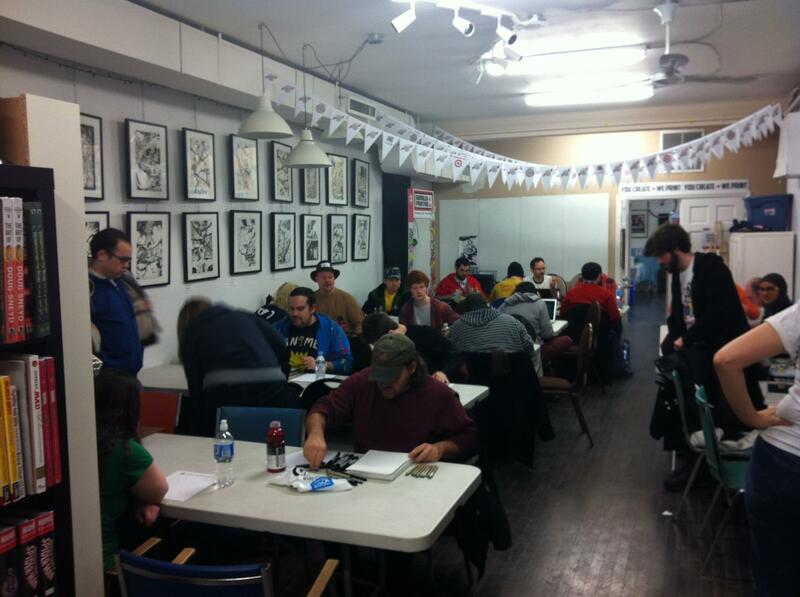 On Saturday, January 5 2013, more than thirty creators showed up at The Comic Book Lounge & Gallery and Guerilla Printing for an event hosted by us (Comic Book Bootcamp! ), and our studio-mates,Comic Book Embassy. (photo by Kevin Boyd) This was from the first few minutes; people continued to stream in over that first hour. A couple turned up in the late afternoon! Our event was inspired obviously as a take off on Scott McCloud’s 24 Hour Comic Day, which was held back on October 20. As Ty said over on ART LAND! !, at that time, we were still getting our class space organised, and there were still many comics-related events taking place, keeping a lot of creators fairly busy. So, we decided to run our own in January as a great start to the new year–a chance for one last fun holiday event before everyone is “officially” back at work and school, a chance to jump in and do the comic book you’ve always wanted to do. The participants’ list for the event fluctuated quite a bit–we kept it restricted to 30 figuring people would turn up at the last minute hoping to join in. So, even though three people didn’t turn up and three more cancelled, we still ended up with 34 people participating during the entire event…although that number is low as there were some who came in throughout the 24 hours and sat down and joined in for anywhere from thirty minutes to several hours. A couple creators had to leave unexpectedly, and a few came in knowing that they wouldn’t be able to stay the entire time-period but still wanting to participate–one actually finished her 24 page comic in the first seven hours, having carefully planned it out at the beginning of the day. But all in all, we were pretty amazed to see the turnout–with creators from all across the GTA, from as far afield as Hamilton, St. Catherines, and Barrie. (photo by Kevin Boyd) Ty turned up to join the participants, “to show solidarity” said he. He finished pencilling and inking that day’s Bun Toon, then headed for home to digitally colour and post it. We’re listing as many of the participants here as we can, with a link to where you can find them online. I’ll put asterisks by those who have posted their comics online. (If they post their finished comic on a different site, we’ll post that link as well.) We had originally hoped to have everyone work on the same size paper and to scan the all so we could post ALL the finished work–but the success of the event quickly put an end to that idea. (photo by Darwin Santos) Many people finished their pages but left earlier. This was the crew that decided they were hanging in for the full 24 hours no matter what! Even after having finished his 24 pages AND a cover for SAD ROBOT, Chris Yao had been valiantly sketching just before time was called. 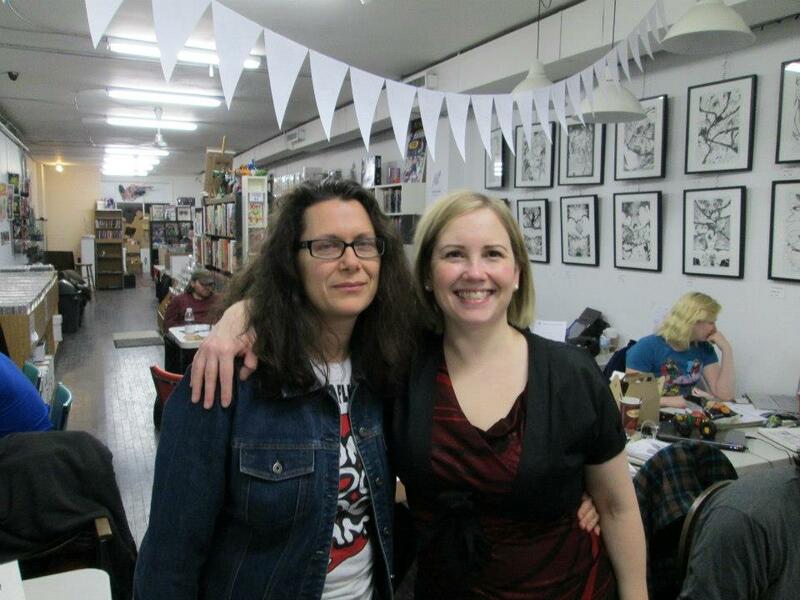 We were thrilled to host this event…and to see the comics that came out of it. I hope everyone who participated came away feeling inspired and ready to create comics–after a good night’s sleep, of course. Aaron Feldman (worked as a team with Rebecca Slack)— Isn’t it Aaronic? Christopher Yao (worked as a team with writer James Cooper)— yaoza graphics studio! James Cooper (worked as a team with artist Christopher Yao)— JAMES COOPER. write. direct. create. **Rachael joined us to work in solidarity with her fellow creators (many fellow Bootcampers/Holmes Inc. contributors), but worked on her upcoming book STEAMPUNK VIXENS. Keep an eye out for news on it’s publication. **Sanya was working on a story that she thinks will end up as a prequel of sorts to an ongoing comic. Keep an eye on her site for information about future publication. **Shane and Ali’s comic is being lettered, and undergoing production. When it’s available for reading, he’ll let us know! Ty Templeton– Ty Templeton’s ART LAND!! **Ty stopped in for a couple hours to work, in solidarity, with the creators. He pencilled/inked his Bun Toon, then went home to digitally colour and post it: New Years Bun Toons. YAY!! 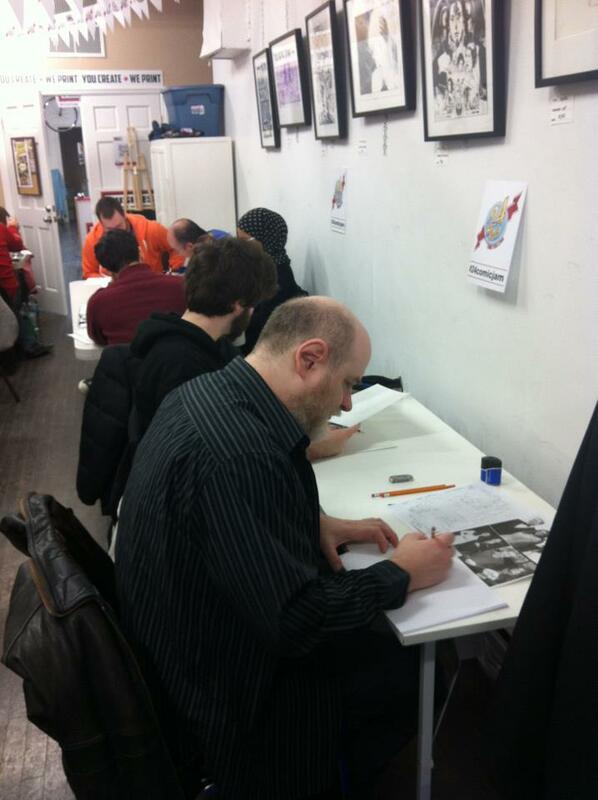 This entry was posted in Events and tagged 24 Hour Comic Challenge Marathon, Comic Book Embassy, comics, Guerilla Printing, The Comic Book Lounge & Gallery, Toronto comic creators by comicbookbootcamp. Bookmark the permalink. Pingback: 24 hour Comic Challenge Tribute Bun Toons YAY! | Ty Templeton's ART LAND! !